Activities for children in Tuscany - a tour in a horse drawn wagon! 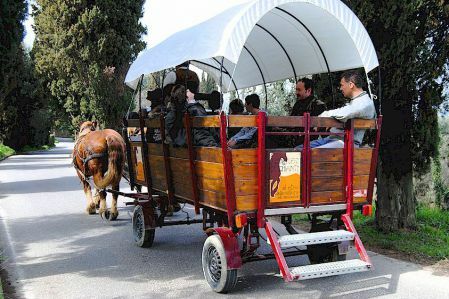 One of the most pleasant ways to enjoy the Chianti countryside, especially if you have young children, is to make an excursion by horse and wagon. Luca Perrotto offers exactly this service, with a starting point near Montespertoli, a town about an hour from Florence or from Greve in Chianti (33 km), and easily reached from anywhere in Chianti. 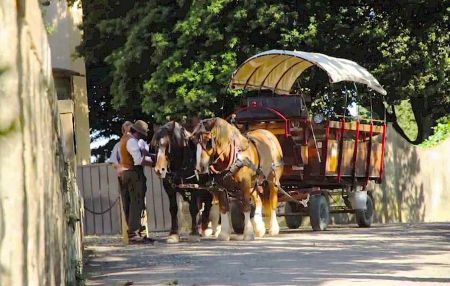 Luca's horse and wagon excursions mostly stay off sealed roads and pass among the olive groves and vineyards of Chianti, with views of castles, villas and farmhouses along the way. A wine tasting or similar activity can easily be incorporated into a shorter outing, and full day tours can include a lunch at a farmhouse or a country trattoria. Also ask him about children's activities en route - he can find story tellers, clowns and other great children's amusements. You can choose from pre-organised tours or request a tour based on your own wishes. A tour can be private - just your group - or shared. More about Luca's horse drawn wagon excursions in Chianti.